Nathan Fillion (/ˈfɪliən/; born March 27, 1971) is a Canadian-American actor. He was born in Edmonton, Alberta. 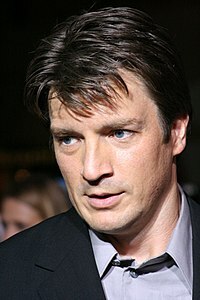 Fillion is best known for the lead role of Captain Malcolm Reynolds in the television series Firefly and its movie continuation, Serenity, as well as his role as Richard Castle on the ABC series Castle. ↑ De Leon, Kris (April 24, 2007). "Hot List: Drive - Nathan Fillion". buddyTV. Retrieved March 22, 2013. ↑ Gary, Denise (February 6, 2013). "Nathan Fillion Birthday Fundraiser for KNTR". Kids Need to Read. Retrieved March 22, 2013. This page was last changed on 3 November 2018, at 05:38.